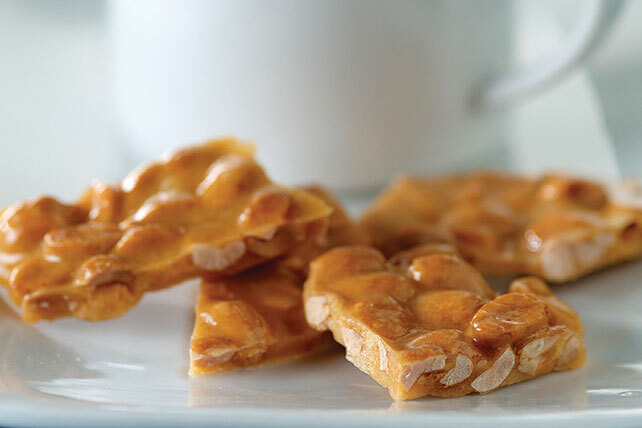 Try PLANTERS Microwave Peanut Brittle for a dessert that looks like it's from a candy shop! Enjoy tasty microwave peanut brittle in less than 20 minutes. Microwave sugar and corn syrup in large microwaveable bowl on HIGH 5 min., stirring after 3 min. Stir in peanuts. Microwave an additional 3 to 5 min. or until golden brown. Spread mixture onto baking sheet. Cool completely. Break into pieces. Substitute 1-1/2 cups PLANTERS Sesame Nut Mix or any PLANTERS Nuts for peanuts.